Rebuilding a Legacy One Product at a Time "Rebuilding a Legacy One Product at a Time"
I recently spoke to Matthew Burgess, Co-Founder and CEO of Burgess Brothers. Burgess Brothers' (BB) was founded by twin brothers Jonathan (Fire-Battalion Chief) and Matthew Burgess (Law Enforcement), in 2012. Both brothers were born and raised in Sacramento, California and are still active in their public service professions. Jonathan holds a Bachelor’s degree in Business Management from the University of Phoenix, Matthew holds a Bachelor’s degree in Philosophy from the University California Davis. 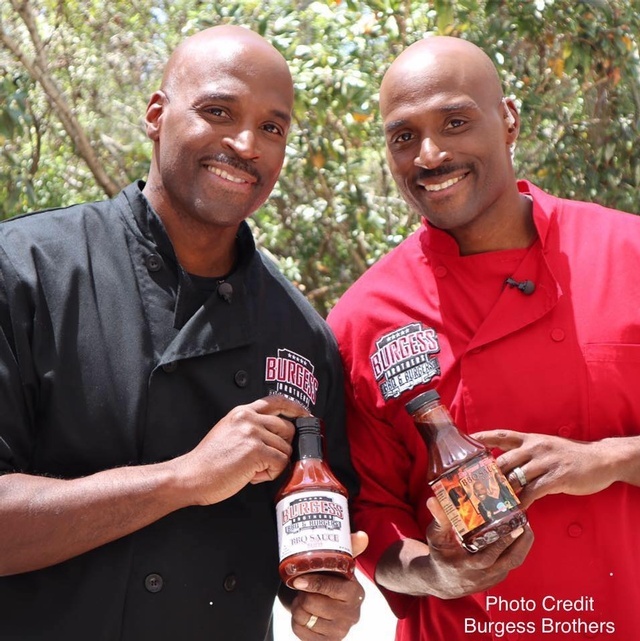 The Burgess Brothers are entrepreneurs, cooks, motivational speakers and brand ambassadors of their own and other brands; with a special passion for youth. Jonathan and Matthew put their heads together to develop and market their signature BBQ Sauces and Homemade Cornbread Mix, the world’s only ChurWaffle™, and now the best hot-links sausage. The Burgess Brothers Hot-Link Sausage was the first and only HOTLINK to be offered in an NBA arena debuting at the Golden One Center. Their cornbread waffle aka ChurWaffle™ is the #1 selling dessert in the Stockton Arena and is slated to debut at several Ballparks this spring. Additionally, the bothers have forged partnerships with local school districts to offer their signature food items in school lunch programs. They do all of this while also mentoring future generations of public servants, entrepreneurs and business professionals. The Burgess Brothers are not only committed to providing quality food and service to consumers but they are also committed to developing and mentoring students in the greater Sacramento area. Why did you and your brother Jonathan start Burgess Brothers? We wanted to rebuild a legacy. We needed to rebuild what our great grandfather started. Our great grandfather was one of the 1st enslaved African-Americans that had migrated to California and one of the first pioneers of Coloma where James Marshall discovered gold. So understanding that he provided us the last name Burgess this was the legacy that he had after being freed from slavery. He found gold and purchase land and became a successful farmer and blacksmith. In addition, he educated African-Americans that were migrating to Coloma. Unfortunately, none of the land was passed down to the family. Our Grandfather also never received credit for his contributions to Coloma. He gave us the motivation and perseverance to build a business and ultimately to have that as a legacy to pass down to generations to come. What is the greatest challenge you have faced with this company? In the beginning it was being provided with the proper opportunities. We created the acronym (K.P.O.P) which stands for Knowledge, Position, Opportunity and Power. In order to obtain opportunity you have to gain the knowledge base. This will position you for the opportunity. Once you get that opportunity comes power. As soon as you gain that power it’s imperative that you release it and grant opportunities to others. What was the biggest aha moment? Creating and trademarking the ChurWaffle™. I had to explain to my brother why I thought it was a good idea to package our grandmother’s all-purpose corn bread mix. I told him that our grandmother’s recipe is too good to be a secret because of the versatility of the product. We need to share it with the rest of the world and monetize from it with the understanding that this mix would open doors for us. My brother and I believe happiness is important. If you don’t have happiness you don’t have success. You can have success but no happiness and that leads to a dark place. Understanding you've got to identify quickly who your allies are. If you don't have allies in places you're going to step on landmines and someone will look to knock you out. Think outside box, look to build or rebuild something that has not been built. Dr. Corinthia Price is the CEO and Founder of Workforce Career Readiness™ and 100 High School Students America Needs to Know About™. She is an international entrepreneurship advisor and workforce development analyst. Dr. Price is an award-winning recipient of the “Top 50 Most Influential Women in Business Award”, "Diversity in Business Award" and was recognized by Mogul as one of the 2018 Honorees for the Top 1,000 Companies with the Strongest Female Leaders.